Paste a spin URL and it will appear as an animated GIF. Or, upload a video, generated from your Sirv account. Note: In April 2018, Facebook stopped displaying animated GIFs on Facebook pages (i.e. pages used by businesses), so follow the video instructions below. Personal Facebook feeds can still display GIFs. 1. Upload a sequence of images to your Sirv account. Sirv will automatically generate a spin file (see our guide on creating spins). If you don’t already have a Sirv account, create an account here. 3. 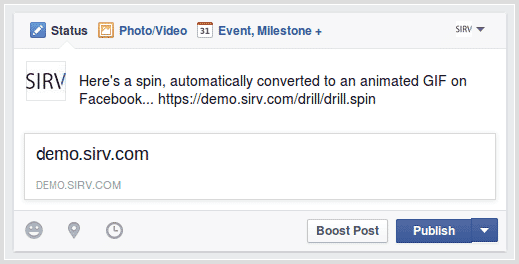 Paste the URL of the spin into a Facebook post and write any text you wish to include in the post. It’s normal if Facebook doesn’t show a preview of the animated GIF. Your GIF will appear as soon as you publish the post. 4. Publish your post and you’ll see a beautiful spinning animation in your Facebook activity feed. The spin will be 500px width and up to 72 frames in length – making a high-quality, smooth animated GIF on Facebook. If your spin has more than 72 frames, some won’t appear in the animation. Click the GIF to link to the original, interactive spin, where users can drag and zoom the spin. If your spin feels too fast or too slow, change the speed with the autospinSpeed setting. Change the default speed (3600ms per rotation) by clicking “Customize”, then going to “Autospin mode”. Decrease the milliseconds to make it faster; increase the milliseconds to make it slower. Alternatively, display your spins as videos. Facebook videos normally autoplay and loop, so they’re a nice alternative to spin GIFs.